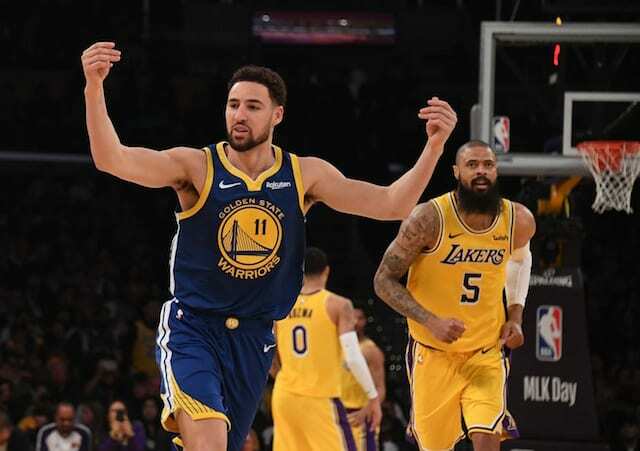 Friday night the Los Angeles Lakers looked to bounced back from their rough loss Thursday night when Damian Lillard hit a game-winning three to beat them. 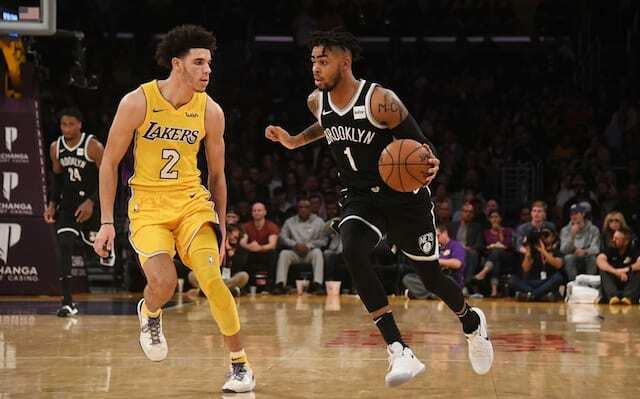 The hosted a familiar face in D’Angelo Russell and the Brooklyn Nets, and Russell made his return to Staples Center for the first time since he was traded this past offseason. With Larry Nance Jr. out for the next four to six weeks with a broken hand, rookie Kyle Kuzma got the start in his place alongside the other four usual starters for Los Angeles. In addition to Russell, the Nets started Carus LeVert, Demarre Carroll, Rondae Hollis-Jefferson and another former Laker, Timofey Mozgov. The Lakers got off to a good start as the rookies Lonzo Ball and Kuzma scored the first four points of the game. Russell responded with a new take to the basket though for his first field goal of the night. Ball started off much more aggressive than he was last night in Portland, although he made just one of his first four shots. Every Laker starter got on the scoreboard in the first six minutes though and L.A. led 15-11 midway through the first. Kentavious Caldwell-Pope brought energy on both ends of the floor early on, as he took a rebound coast-to-coast for a layup to give the Lakers a 19-11 lead. 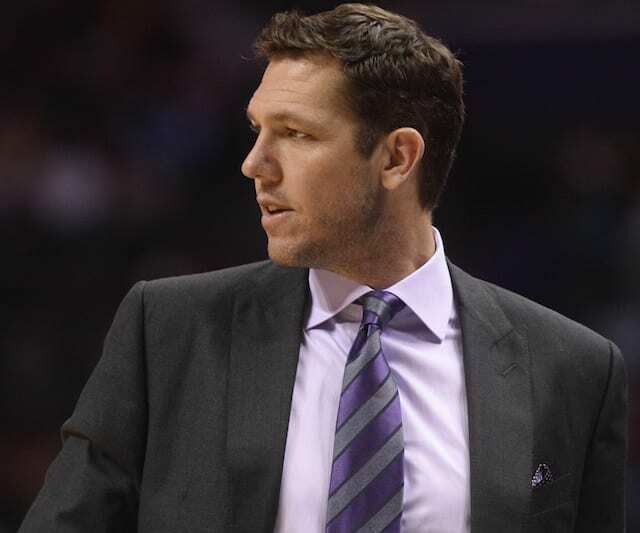 Brooklyn responded with five straight points though forcing Luke Walton to take a timeout. The Lakers second unit continued their impressive defensive play, as a steal by Jordan Clarkson led to a three-point play. The Nets closed the quarter on a run, capping it off with a silly foul by Corey Brewer on a half-court attempt to beat the buzzer by Carroll and the Lakers lead was just one at 30-29 after one quarter. Clarkson got the scoring started in the second quarter with a floater, giving him a game-high 10 points off the bench. 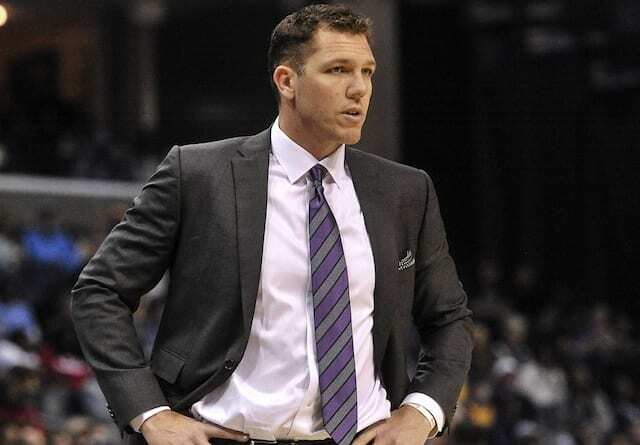 The former Lakers, Russell and Mozgov, scored seven straight points for Brooklyn to tie the game at 36 causing Walton to use another timeout. Brandon Ingram way playing with more aggression than he has this entire season in the second quarter, as he had two big blocks on the defensive end and drained a big three on offense to put his team up seven. He then found Kuzma for a wide-open three a couple possession later and the lead was up to nine. Kuzma closed out the second quarter on a scoring tear, as he ended up scoring 17 first-half points. The Lakers built their lead up to 13 but the Nets once again closed the quarter well and the Lakers lead was 64-55 at half. Russell got the scoring started in the second half with a steal and then a layup at the other end. The Lakers responded with five straight points though to reestablish their lead at 14. The Nets went on a 10-2 run though as Ball struggled with his shot, and the Laker lead was down to seven, with Russell leading the way with three buckets in the run. Out of a timeout, Lopez drained another three to end the run, with the shot clock running down this time. He then drained another three after a turnover by Brooklyn and the lead was back up to 13 as Lopez led all scorers with 25 points midway through the third. 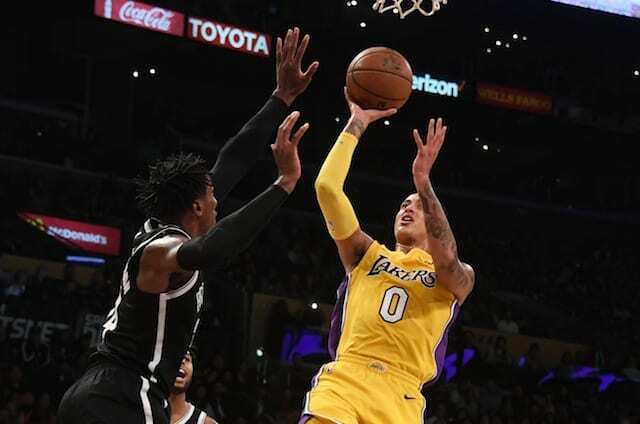 The bench was able to hang onto the lead behind stellar play from Clarkson, but the Nets drilled a long three to beat the third quarter buzzer so the Lakers lead was 95-84 at the end of three. An easy dunk by Julius Randle put the Lakers lead up to 13 to start the fourth and final period. He quickly picked up his fifth foul after that though, so Lopez, the star of the night, returned to the floor. Lopez and Kuzma showed some good chemistry in their first game starting together in the frontcourt, as Lopez knocked down his sixth three of the game to put the Lakers back up by 14. The Nets had back-to-back three-point plays though with six minutes left to cut the deficit to 10, so Walton called a timeout presumably to get his starters back in. Lopez ended the 8-0 run with a putback dunk, but Carroll answered quickly with another three-point play and the lead was down to seven. With the lead down to six and three minutes remaining, Ingram and Kuzma hit back-to-back buckets to get it back to double digits. The team’s exchange baskets for the next couple minutes, which secured the 124-112 victory for the Lakers as there was no comeback to be had.